With Monkey Madness II set to come out next Thursday, this week's update is a small one. Nevertheless, we have some great quality of life updates to see you through until the release of the first Old School quest! A button which allows you to call your pet to appear next to you has now been added to the equipment interface. If you have a pet out and you can't seem to see them, give this button a click and your pet will appear next to you. Of course, the call pet button won't allow you to summon your pets into areas they would not usually be allowed. 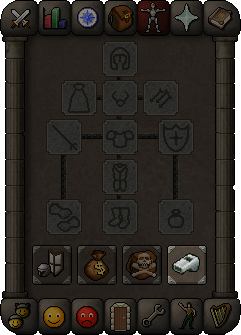 We've updated the Deadman Mode items lost on death interface to be up-to-date and to provide you with information on what you will lose in the various ways you may meet your demise. 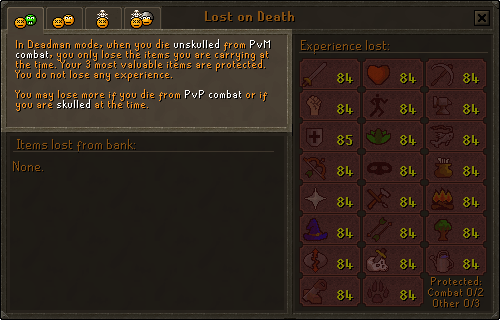 To accompany the recent update to experience lost on death in Deadman Mode, in the next few weeks we will be adding an interface to appear on respawn to let you know how much experience you lost. Have you ever mistakenly planted a seed before you compost a patch? Have you ever lost a crop to an uncomposted patch? Well, never again will you have to live through such torment. 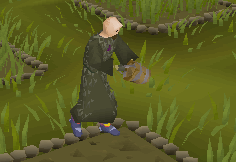 It is now possible to use buckets of compost or supercompost on a farming patch in the same way the Fertile Soil spell of the Lunar spellbook works. Worlds 319, 357, 360 and 378 are no longer seasonal Deadman Mode worlds. More Hellhounds have been spotted heading into the Witchhaven dungeon. Gargoyles, Bloodvelds, Aberrant Spectres, Abyssal demons and Nechryeals a-plenty! You should now find it much easier to fight these creatures in the Slayer tower with friends, as more spawns have been added. All random event music tracks will now be unlocked with any random event which has its own music. Many players voiced concerns that they were left with 1 or 2 tracks to complete their music cape, and could not get the 1 specific random event they required to unlock it. This should make that easier. The random events with unique music tracks are: Drill Demon, Evil Twin, Freaky Forester, Frogs, Maze, Mime, Pinball, Prison Pete, Quizmaster and the Surprise exam. Run energy is now restored at the end of the tutorial. If you already own a boss pet, you will now receive a message to inform you that you would have obtained the pet on that kill – if you did not already own it. The spelling of Monocle has been corrected for player owned house treasure chests. The spelling of Fremennik has been corrected in the Fremennik diary's journal. The King Black Dragon's drops will now appear where it died if you are lucky enough to receive a Prince Black Dragon. Previously, the drops would appear under the pet. The Confusion beasts from A Soul's Bane quest are now immune to venom. A grammar error has been corrected when entering the Legend's guild. With only one week until the release of Monkey Madness II, now is the time to prepare yourself for the release of the first ever Old School RuneScape quest! If you haven't yet seen the requirements for the quest, check them out and get training! We are currently running a priority survey to help us better understand the Old School community as a whole. The results of this survey will help us construct a priority poll which will be coming to a poll booth near you in a few weeks time. Don't miss your chance to help shape the future of Old School. Click here and fill out the priority survey. Do you have any info on why 349 has been lagging for the past few weeks? where are the new Clues scroll rewards as u said?? why? devalues my music cape. The thing about music cape was that you really needed to get every single track. wow such easyscape. what the news of redevelop funorb games and armies of gielinor ? And what is the process with Chinese party? deadman: how many bank items lose of unskulled and skulled? skulled with more keys lose more?